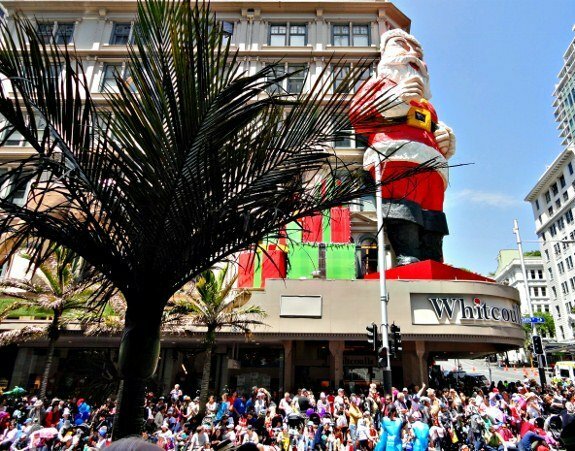 Christmas in New Zealand and Australia comes in the summertime so it was a bit different for us, northerners raised with visions of a “White Christmas.” In Auckland, we stood on the sidewalk waiting for the Santa Parade and took in the crowd around us; it was the usual mix of families, old-timers and teens traveling in packs. One thing was different though for a December activity, almost everyone was wearing t-shirts and shorts under the watchful gaze of palm trees and sunny blue skies. It’s beginning to look a lot like . . . wait, what? 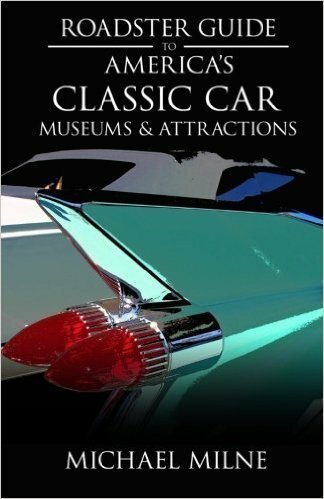 Due to the balmy weather Christmas Day traditions include firing up some shrimp on the “barbie”, sailing on the turquoise tinged waters of Waitemata harbor or playing a game of cricket in the park. 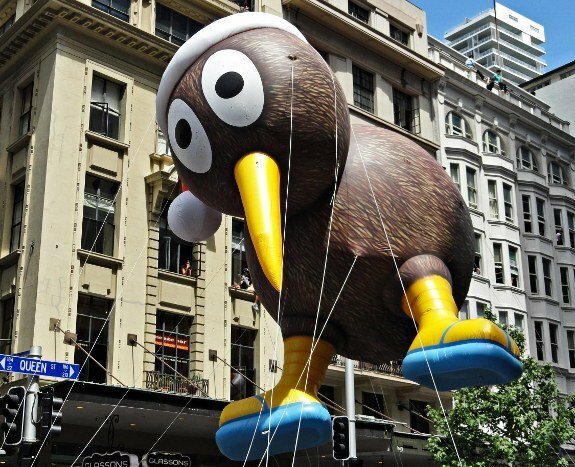 That may not be much different from warm places in America like Miami or San Diego; but we doubt that the highlight of those cities’ Christmas Parades is a giant balloon of a Kiwi bird wearing a Santa Claus hat. A Christmas tradition in New Zealand, the kiwi bird. We joined the crowd in cheering on the floats featuring beach and surfing scenes. But when it came time for the big guy, Santa himself, the palm trees were just a memory. His float was covered in white with “snow” covered trees and a castle. 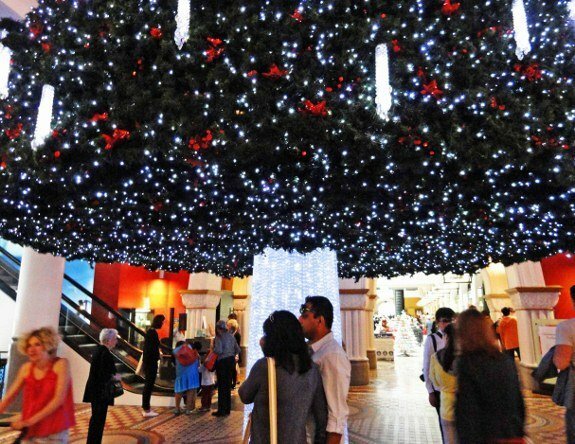 Even Down Under, the dream of a White Christmas lives on. Many smaller towns host Santa Parades as well. Dunedin on the South Island featured that old Christmas chestnut, Snoopy and longtime nemesis the Red Baron engaged in a blocks long dogfight down the main drag. We’re not sure what it had to do with Christmas but the kids seemed to eat it up. 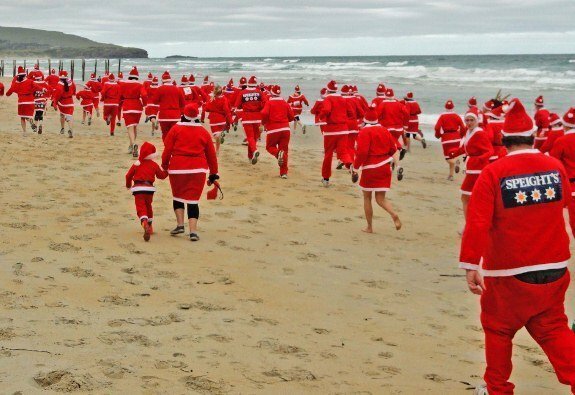 Santas and surfers come together in New Zealand. A new event is the Santa Run to raise money for the KidsCan charity. The race takes place in seven cities throughout New Zealand. 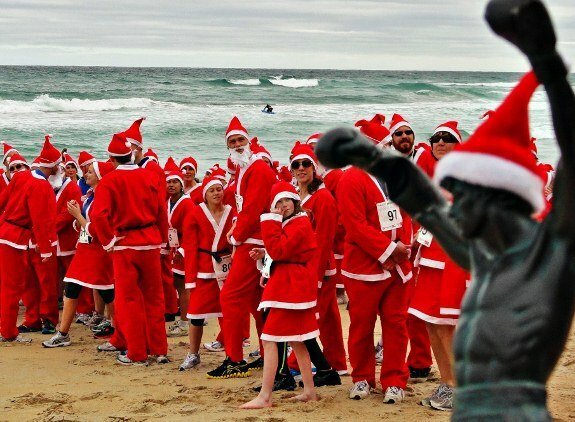 For a donation each runner is given a Santa suit to wear. Race veterans often show up in homemade outfits as elves or reindeer. The run in Dunedin takes place on the beach with the starting line just across from the local pub. 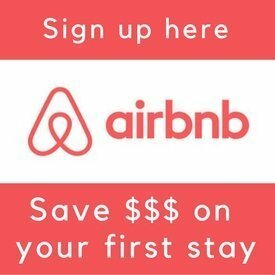 It’s easy to find affordable hotels in Dunedin close by. There was clearly a party atmosphere but fortunately the race, if it can be called that, was mercifully short so casualties were few. Cue the “Chariots of Fire” music. New Zealanders also include customs of the first settlers of this land, the Maori. Christmas cards and decorations bear Maori motifs while many dig into a Maori treat called a hangi. Similar to a Hawaiian luau, hot stones are placed in a hole in the ground and then lamb, potatoes and whatever else strikes the chef’s fancy are placed on top of the stones to bake. 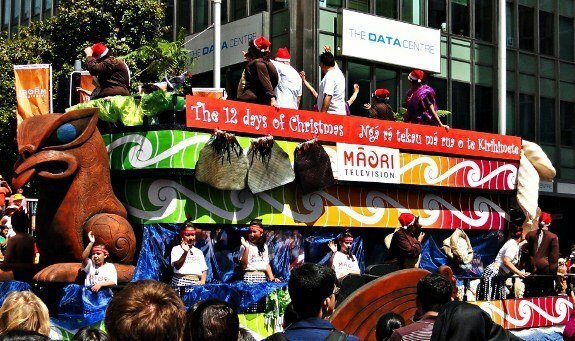 A warm Meri Kirihimete is wished: that’s Maori for Merry Christmas. Not so different from the Hawaiian Mele Kalikimaka. A tribute to the original island people, the Maori. Across the Tasman Sea the Aussies have put a unique spin on Santa’s flight path. Apparently it’s too hot in the Outback for reindeer, so Santa is propelled by six white “boomers,” also known as kangaroos. One bush country resident, innkeeper Deb Wright, said, “It’s so hot that we usually have cold meats and salads for the main meal and much beer is also consumed due to the delirious heat.” Despite the weather, stores are decorated with snow-filled winter scenes. 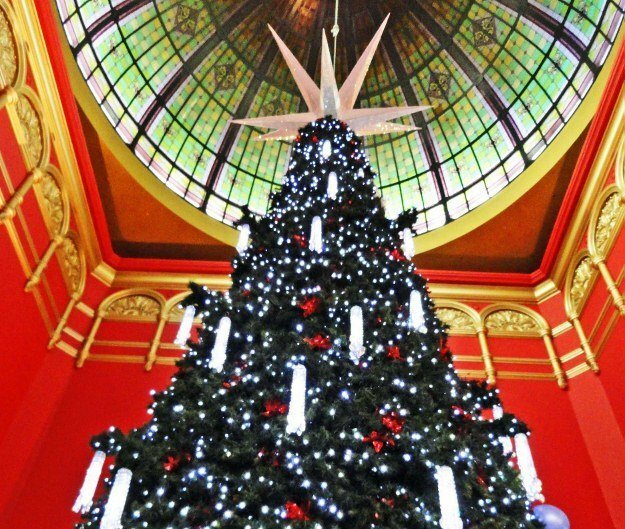 The Christmas tree at the Queen Victoria Building in Sydney is the only one we’ve seen that visitors can walk under. The holiday season was a poignant time in Christchurch last year. The city suffered a devastating earthquake that destroyed the downtown and killed 181 people. There was talk of cancelling the annual Santa Parade due to the traditional downtown parade route being closed off for safety reasons. However, the parade was rerouted and went on. In Christchurch a message of hope for the New Year. The international symbol of the devastation wrought on the city was the heavily damaged Christchurch Cathedral. At Christmastime last year three larger-than-life sculptures of angels were hung from the rafters. However, due to the quake the building was rendered unsafe and will eventually be demolished. 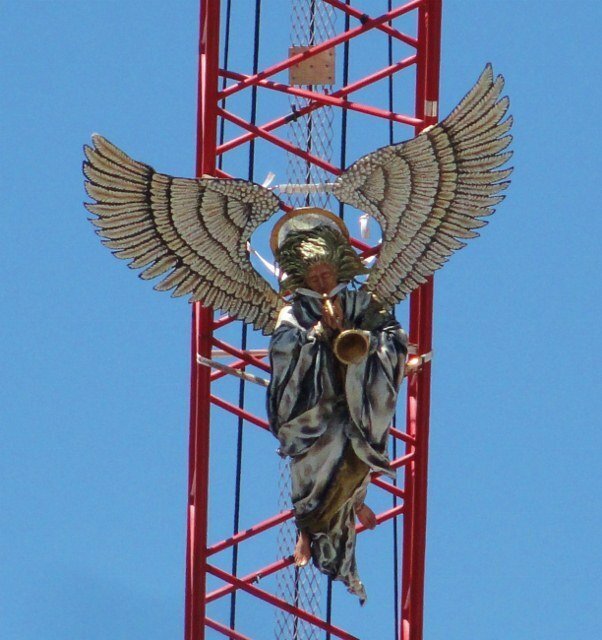 This year the angels are being suspended from construction cranes that are assisting in the rebuilding. The angels represent consolation, comfort and hope. What fitting symbols to watch over the residents of Christchurch during this season of birth and renewal. 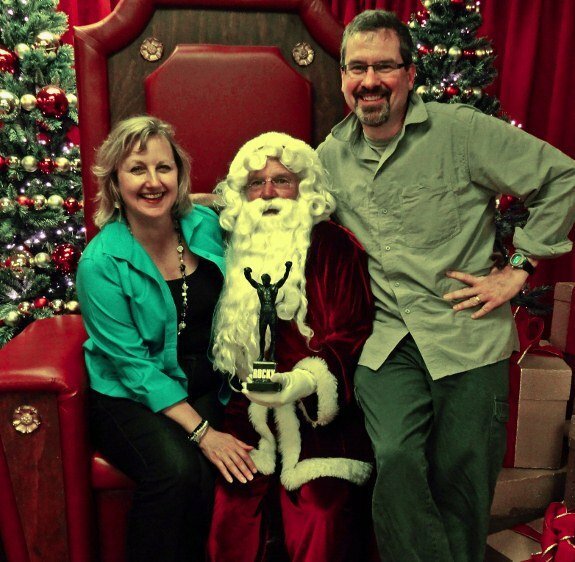 You’re never too old to pose with Santa Claus, here at Ballantynes in Christchurch. And if you are planning to visit New Zealand, don’t make the same mistake we did and make sure you have a roundtrip ticket. We almost got deported flying to New Zealand on a one-way ticket. 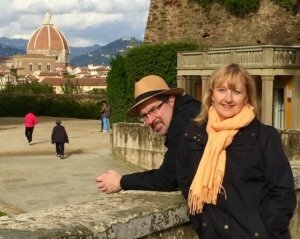 We’ve been traveling around the world as global nomads since 2011. 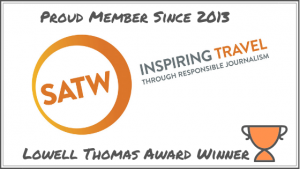 To receive free monthly updates and valuable travel tips from us sign up here.